Found a bug in this game and fixed (9-6-17) missing items such as hearts and statues. Bug found in game and fixed (9-10-17) incorrect dialog locations. 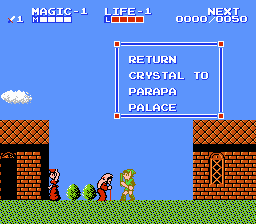 Added reference to patch number on title screen scroll (9-10-17). All of the incorrect dialog locations fixed (9-11-17). Fixed spelling mistakes and dialog box bleeding (9-30-17). EXCELLENT! 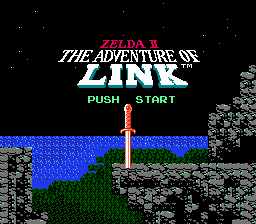 Finally, a Zelda 2 English translation for Famicom! I’ve been waiting for this so long! I must say I feel this translation encourages me to play this game with English signs! And after all, I enjoy how you fit the letters as well. And as for the bugs, glad that many of them have been fixed successfully. Very nicely done and awesome job!